Join the discussion on our forums! Come discuss Gurubashi Hypemon over in our dedicated Gurubashi Hypemon discussion topic. Why does he have a peg leg? Trolls can regen limbs. this card is just too slown to see any play. But in a future expansion if rogue gets a decent board clear+heal to support a more control oriented archetype this might see play. Completely agree. This along with Spirit of the Shark is amazingly awesome! I don't know why they think a 5/7 with rush summoned from an 8-mana 6/3 is such a huge problem, but I guess that's how it is. Not sure in which deck this card fits. Overall, not too bad, but not too strong. Dont think it will see play, other than the first days of testing. 1 mana Gral, 5/7 is pretty good for him to eat as well. 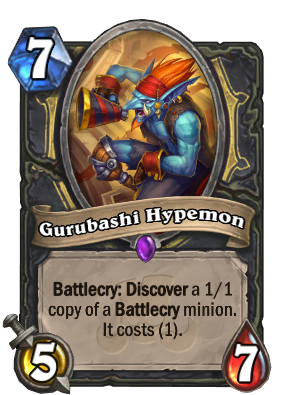 Also 1 cost for late game combo activators... interesting to say the least. I'm putting two of these in my Yogg deck. All praise! It's a rogue card so that doesn't work. You can only get neutral or own class cards, that's how the Discover mechanic works. Oh i guess you meant you can discover Tess itself? Lol that would be neat!